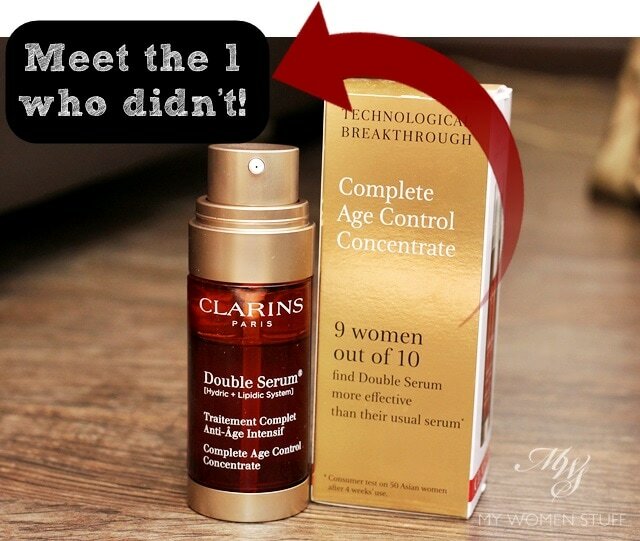 Home » Product Reviews » 9 out of 10 women love the Clarins Double Serum – Meet the odd one out! 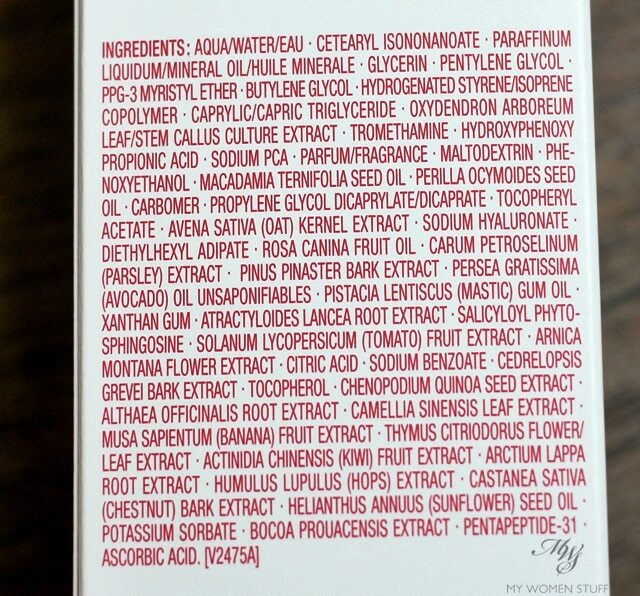 What this serum is, is an anti-aging serum. This is the newest incarnation of Clarins’ concentrated serum to target anti-aging. Their earlier versions were targeted at women with more matured skin. I was told it was primarily targeted at those 40 and above. All well and good. I like that there are skincare made for women with more matured skin because we don’t stay young forever, and when you are a certain age and you have different skin concerns, a product meant for a sweet young 25 year old just won’t cut it. You need something more. But Clarins decided they wanted to make things younger. Introduce this to the young crowd, so the Double Serum Complete Age Control Concentrate can be used “as a preventative measure” from the 20-somethings and up. I don’t know, maybe I’ve left my 20s for too long, or my skin just wants to remind me I’m no longer in the 20-something category. On paper, this was a promising product. The bottle is cleverly separated into 2 halves, with one half containing an oil and the other, a water based compound. It claims to contain loads of anti-aging ingredients and works to boost hydration, radiance, plump up lines, fight stress, pollution… is there anything else this wonder serum can’t do? Instead of having 2 pumps, as they did before, the new design cleverly integrates the 2 halves of the bottle so you are guaranteed the perfect “Golden Ratio” of product every time. 80% serum, 20% oil. This is what it looks like when you pump it out. The golden honey colour gel-like product is the hydric system while the clear bit around it is the oil or lipids. You then mix it all up in the palm of your hand and apply to your skin. If you fear using oils, then this was made for you because the combination of product ensures that this one is never oily. The golden ratio of oil to water allows it to absorb into your skin without it once feeling greasy or sticky or oily. They didn’t mention filmy. That’s how it felt to me. I feel like there is a film on my skin every time I apply this. It wasn’t terribly unpleasant but I did notice it. No one else mentions it however so maybe they aren’t as sensitive. I was told that most women found an almost immediate lift and radiance to their skin the next morning after using this serum. I didn’t. Now, I recognise an immediate effect when I see one. The Estee Lauder ANR2 does give me that next-morning glow. I didn’t experience it with this serum. Let us just say that I experienced nothing using this serum. My nose was assaulted by the strong scent every night, and my skin with that filmy texture that I didn’t like. I didn’t break out nor experienced any adverse reactions but this is just one of those things that you try, try hard to like and just fail. I like Clarins products generally (except their whitening range but then I don’t like most whitening ranges in most brands) and I really like their Hydraquench range for skin hydration. This Double Serum may have been their biggest discovery in 30 years and it may come highly raved by many but I’ll skip it. It’s far too pricey a product to do just nothing. A highly raved, much touted anti-aging serum from Clarins that did nothing for me. No glow, no radiance. Fragrance is too strong and the product left a film on my skin I was not comfortable with. As with all skincare, take my view with a pinch of salt. As I said, I am but 1/10 women who did not love this one to the moon and back. I couldn’t even use up a significant amount as you can tell from the bottle, simply because it just did nothing. I went back to my Estee Lauder ANR (previous version) and I found my skin looked better. I knew then that there was no point in my continuing to slather my skin with a product that does nothing, when I could slather it in a product that does everything right. Sorry Clarins, better luck next time. 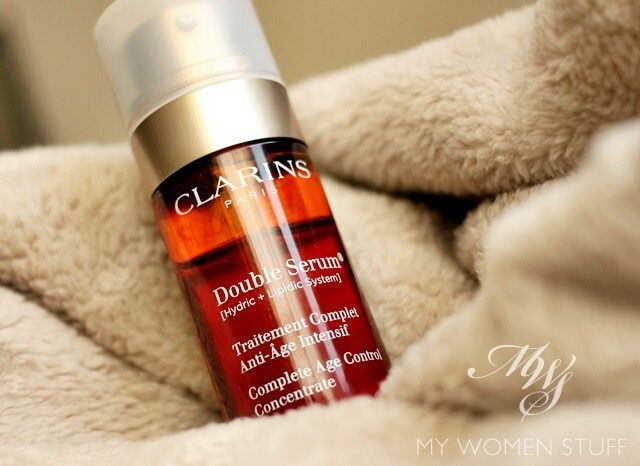 Have you tried the Double Serum and do you love it? I love this serum! I think I saw some visible effects on my skin after use. I also appreciate that it’s oil-based, but lightweight therefore suitable for oily combination skin like mine. Is your skin type more dry? I think this might be too light for drier skin, therefore you didn’t observe any effect? Hi Paris,I’m using Estee Lauder ANR 2.That worked well for me.But Clarins Double Serum works for me too.I’m one of the 9/10 who finds the smell soothing and lovely.It gives me a glow when I wake up in the morning and my skin is noticeably smoother.Both ANR2 and Clarins Double Serum works for me.But personally I prefer ANR 2 because with Clarins you need to be careful with the amount you use.I have very dry skin and I’m living in Adelaide(extremely dry weather) and yet Clarins Double Serum still managed to break me out when I’m not careful with the amount I use(I’m a little surprised myself).I think I’ll still stick to ANR 2 and may be try out Kiehl’s MRC as you highly recommend it.FYI,I think your claim that it only work for younger skin might be true as I’m 22 this yr(a bit younger than other readers?). tried this but i don’t see any results from it all at. well to be honest I just used the 7 days sample that the SA gave to me from Clarins counter and I used it for a week before committing to a full size product, well the serum didnt break me out yet it didnt do anything to my skin, and as you said if a product promises to see a difference just after one use then you would espect alot from it. i was hesitated to buy it or not, thinking that if I used for longer period I may see a result but after reading your review am 100% sure that I dont need this product at all. Note: I used Lancome Vissionnaire serum and I loved it but it is so expensive, that’s why I am still searching for a good serum but with less price, I may try the LE serum! I am a 44 year old mum youngest is just two years old and my life is hectic with very little sleep. 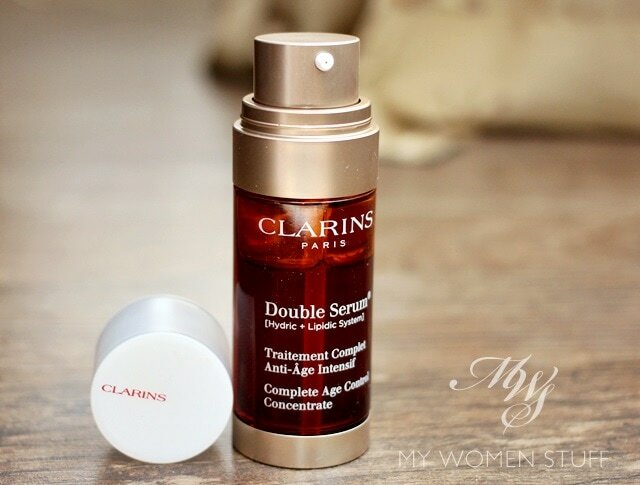 I use this Clarins double serum every now and again because of the price. I apply it on the night before a special occasion and the next morning I have such a glow I almost feel I look 10 years younger. Ok at 44 I don’t have many wrinkles and non that show anyway. I guess I have good skin but this does stuff does work for me. So my conclusion to this that perhaps it is targeted for the older woman who’s skin has lost that glow and elasticity and you 20-30 year olds need to concentrate on perhaps on other products.